"Hot Like Fire"/"The One I Gave My Heart To"
(1997) "Journey to the Past"
(1997) "Are You That Somebody?" "Journey to the Past" is a song from the 1997 20th Century Fox animated feature film, Anastasia. It was written by lyricist Lynn Ahrens and composer Stephen Flaherty, and originally recorded by American actress and singer Liz Callaway in her role as the singing voice of the film's title character, Anastasia. A pop rendition recorded by American R&B recording artist Aaliyah is played over the film's end credits, and was released as a single from the film's soundtrack album. "Journey to the Past" is a predominantly pop ballad that is influenced by contemporary R&B music. "Journey to the Past" has received mixed to positive reception, many praising Callaway's version, but criticizing Aaliyah's pop rendition. The song was nominated for an Academy Award for Best Original Song at the 70th Academy Awards in 1998, but lost to "My Heart Will Go On" from Titanic. The song was also nominated alongside "Once Upon a December" for a Golden Globe Award in the same category, but again lost to the theme song from Titanic. It became a moderately successful pop hit in the UK. The song did not chart on the Billboard Hot 100; it only received minor adult contemporary airplay in the U.S. It stayed on the chart for only 4 weeks. The song was released to U.S. adult contemporary radio on March 31, 1998 as the soundtrack's second single. The song was originally dubbed into 28 languages for international release. Along the years, the number of foreign versions has grown, with some new dubs and, beside the official dubs, several local TV stations made their own dub, or re-dubbed an existing version, in local languages (e.g. Albanian, Egyptian Arabic, Czech, Polish, Taiwanese Mandarin, Korean, Slovak, Vietnamese, and so on). In the Flemish version of the movie, only young and adult Anastasia and Dimitri were dubbed in Flemish. For the rest of the characters, the Dutch dub was used. Arabic رشا رزق (Rasha Rizq) "آه لو في الأحلام" ("Ah law fel-ahlam") "Ah if in dreams"
Brazilian Portuguese Juliana Franco "Viagem ao passado" "Journey to the past"
Bulgarian Елена Павлова (Elena Pavlova) "Път назад" ("Pŭt nazad") "Way back"
Canadian French Catherine Léveillé "Quand on revit son passé" "When you live your past again"
Castilian Spanish Virginia Martínez "Dime dónde vas" "Tell me where you are going"
Catalan Virginia Martínez "Cap on vaig" "Where I’m going"
Czech Alice Bardová ? ? Danish Nicoline Møller "Rejse mod mit gamle hjem" "Journey towards my old home"
Dutch Vera Mann "Terug naar toen" "Back to the past"
European French Katia Markosy "Voyage dans le temps" "Time travel"
European Portuguese Lúcia Moniz "Regresso ao passado" "Return to the past"
Finnish Petra Karjalainen "Matkallani menneeseen" "On my journey to the past"
Flemish Sanne Denotté "Terug naar toen" "Back to the past"
German Jana Werner "Reise durch die Zeit" "Journey through time"
Greek Μαντώ Σταματοπούλου (Mantó Stamatopoúlou) "Μια βουτια στο παρελθον" ("Mia voutia sto parelthon") "One dip to the past"
Hebrew לימור שפירא (Limor Shapira) "מסע אל העבר" ("?") "Journey to the past"
Hungarian Pápai Erika "Vár a múlt" "Waiting for the past"
Icelandic Svala Björgvinsdóttir "Aftur heim" "Back home"
Japanese 鈴木ほのか (Suzuki Honoka) ? ? Korean 이정화 (Lee Jeong-Hwa) "과거 찾아 가는 길" ("Kwagŏ tchaja kanŭn kil") "Looking for a way to the past"
Latin American Spanish Thalía "Viaje tiempo atrás" "Journey back in time"
Norwegian Anita Skorgan "Vei til det som var" "Way to what was"
Polish Katarzyna Skrzynecka "Wspomnienia z dawnych la" "Memories from the old years"
Russian Мария Кац (Mariya Katz) "Не страшно будет мне" ("Ne strashno budet mne") "I won’t be afraid"
Swedish Helen Sjöholm "Resa hem igen" "Journey home again"
Thai จันทร์จิรา นิ่มพิทักษ์พงศ์ (Chanjira Nimpitakpong) "เดินสู่ความหลัง" ("Dein s̄ū̀ khwām h̄lạng") ? Turkish Tuğba Önal "Uzanırken geçmişe" "Reaching to the past"
Critical reception for "Journey to the Past" has been generally mixed to positive. Erin McCarty of Epinions praised the original Liz Callaway version of the song, saying Callaway "voices Anastasia with a clear-throated exuberance and beauty that reminds me of Jodi Benson from The Little Mermaid." Filmtracks called Callaway's version of the song "attractive". DVDTalk named the song "the film's best tune", and a prime example of "songs that stick with you and beg to be repeated". The Stage wrote "Somewhere Out There from An American Tail, and the titular Journey to the Past from Fox’s Anastasia, demonstrate that Disney did not always hold the monopoly on beautiful standards." Cinematter said "The songs are enjoyable, but only two (Journey to the Past, and Once Upon a December) have any lasting presence." McCarty's review of Aaliyah's pop rendition of the song was more mixed: "...as is almost always the case with these animated musicals that produce radio hits, I prefer the in-movie version." Stephen Thomas Erlewine of Allmusic gave a somewhat positive review of Aaliyah's rendition, calling it a good version of a song that sounds better in its original form. The music video begins in a modern-day American neighborhood on a seemingly warm day. Aaliyah is seen singing in the windows of a small grocery store and on the street where children are playing in an open fire hydrant. 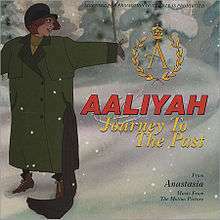 Tying in to the theme of going back to the past, Aaliyah goes back and forth from the real modern-day world to the animated world of Russia in the 1920s, the time in which Anastasia is set. She is then seen in several of the movie's iconic scenes such as balancing on a log with Anastasia behind her, out in the snow where the "Journey to the Past" song is featured in the film, in the ballroom in the "Once Upon a December" sequence, ascending the lift in the Eiffel Tower (the "Paris Holds the Key (To Your Heart)" scene) and on stage in the Russian ballet scene. The fountains of Jardins du Trocadéro can be seen briefly. The music video ends with her sitting on the rooftop seemingly overlooking the final scene in which Dimitri and Anastasia kiss and finally on the clouds above St. Petersburg with the children. ↑ "International Theatrical Dubbing: It's More Than Meets the Eye". awn.com. Retrieved 2016-03-06. 1 2 "Anastasia". Charguigou. Retrieved 2016-08-24. 1 2 Erin McCarty. "The Anastasia Soundtrack". Retrieved 19 August 2012. I love this song, and as is almost always the case with these animated musicals that produce radio hits, I prefer the in-movie version. There’s such an air of wonder and anticipation, as well as trepidation, about it, and I can relate so well to that tug-of-war between a longing for adventure and a fear of leaving the familiar. The song reminds me a lot of I Have Confidence from The Sound of Music, and it’s one of my two favorites in the movie. The piano and violins evoke the snowflakes and wind that accompany her as she sets out. Liz Callaway, singing in place of Meg Ryan, voices Anastasia with a clear-throated exuberance and beauty that reminds me of Jodi Benson from The Little Mermaid. ↑ "Anastasia Family Fun Edition". DVD Talk. Retrieved 2016-03-06. ↑ "The Stage / Reviews / Helena Blackman - Journey to the Past". The Stage. ↑ "Anastasia". cinematter.com. Retrieved 2016-03-06. ↑ "Journey to the Past"
↑ "Chart Data: Aaliyah". Mariah Charts. November 21, 2007. "In the Dark of the Night"